At Okun Orthodontics, we care about making the world a better, happier place, and we know that you do too. We want to take this opportunity to share the many approaches we take to ensure that we have a healthy and safe environment both in our practice and outside in the world. One of the biggest things we do is to take only digital x-rays. Digital x-rays are healthier for you and better for the environment. They are healthier for you because of their low radiation. They are healthier for the environment because they do not require toxic developing and fixing chemicals. In addition, they have several advantages for you. The images are available instantly on our computer- there is no wait time for processing! Also, you and your general dentist can view your images online through the log-in feature on our web site and we can easily print out copies of your x-rays for you to take to your dentist if he/she does not have internet access or does not have an e-mail address. 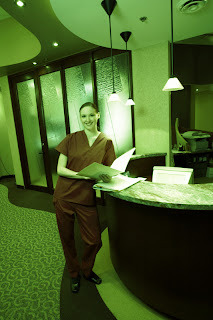 We also avoid chemicals as much as possible in our sterilization and cleaning procedures. Instead of chemicals, we use heat sterilizers, so we achieve the same effect but without introducing toxins. To clean our floors and counters, we strictly use green all-purpose cleaners. Another great thing about greening our practice is that it is great for people with allergies. We take every precaution to prevent allergies in our office. We ask that you inform us of any chemical sensitivities and allergies so that we know when we need to avoid Nickel in the brackets and arch-wires of your braces. Also, the elastic ties that we use at Okun Orthodontics are not latex or silicone; they are polyurethane. Whenever possible, we use fragrance-free products so that we do not pollute our indoor air. (Also, none of our staff wears perfume.) We have a HEPA air filter which we consistently run it to make sure our air remains clean and pure. Instead of latex or nitrile (which are both common allergens), we use vinyl latex-free gloves. So, next time you visit Okun Orthodontics, you can breathe deep knowing that you are not only getting the best orthodontic treatment around, but you are visiting a truly green and environmentally friendly practice.